Saving energy in your home will not only save you money, but will also help the environment by reducing the need for hydro-electric dams and fossil fuels used to produce electricity. These steps will pay for themselves again and again for years to come. The average home looses up to 20% of its heating due to drafts. Doors, windows, outlets, and switches are all common areas of heat loss. Most heating bills in our area can be $2000 a season or more meaning those drafts can cost you $400 a year! That buys a lot of weather stripping and caulking. Most doors and windows are easy to check with just your hand, if you feel the cold air coming in then you are loosing heat. Outlets and switches also can be drafty, if you feel cool air around them, consider foam gaskets under the cover plates. Old single pane windows can be made more efficient by installing storm windows or inside magnetic panels to reduce drafts. Read more on caulk and weather stripping here. During the day, let the sunlight in to reduce lighting costs, but at sunset, closing curtains will also help reduce heat loss. 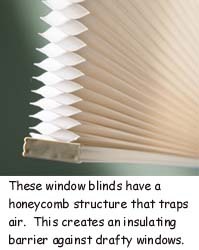 Consider cellular blinds as they are more energy efficient then blinds and shutters. Turning down your thermostat by one degree can save over 5 percent on your heating bill. Consider electronic thermostats with built in timers to reduce energy use when you are at work or sleeping. You can still awaken to a warm house and not use energy when you don't need to. Avoid heating rooms you don't use by closing heat vents or turning down individual room thermostats. Have your heating system checked regularly to assure that it is running at top efficiency, and always keep air filters clean. A tiny change in a furnace or boiler systems combustion can dramatically lower your heating bills and will often pay for the service call in energy savings. Water heaters use a lot of energy and should have the thermostats set to 120 degrees. Not only will this save energy, but dramatically reduces the risk of scalding injuries. If it is set higher, you will be using a lot of cold water to bring the temperature down. Gas how water heaters have their thermostat on the exterior and are easy to set, electric heaters are under cover and should be set by a professional. Read more about energy efficient water heating here. Take showers instead of filling a bath and save about 50% of the energy. Low flow shower heads save both water and energy. If you have a hot tub, make sure the cavity under the tub is insulated and you use a insulated cover. Turn down the heat when you are not going to use it for an extended time. Lighting is one of the easiest ways to save energy and money. Compact florescent lights (CFLs) are direct replacements for standard incandescent light bulbs. The 100 watt equivalent lights can last 13 times longer and use less then 1/4th the energy. When you buy and install a 6 pack of CFLs, it is like putting $550 in your pocket! They have styles now for replacing bathroom globes and outdoor flood lights. But remember they can't be used with dimmers, and must be disposed of properly. Most hardware stores will take the old lights back. Computers use significant energy, especially those that are left on all the time. Remember a screensaver saves no energy, but hibernation does, or better yet power them off and save more. Modern LCD displays use 1/3 the energy then a old CRT. Same with most laptops, they are more energy efficient then a standard desktop. TV's use power all the time, even when they are turned 'off'. Most entertainment devices with remotes (DVD players, VCRs, stereo equipment also use power in standby mode. Unplugging them when you are not using them will save energy. Keep freezers free from excessive ice buildup. A defrosted freezer is more efficient. Open the doors a minimum amount of time to keep the cold inside. Every time a refrigerator door is opened, the compressor had to re-chill the contents. Laundry is another big power user, so wash full loads. Use the coolest water temperature that will do the job, and always rinse with cold water. The washing machine itself doesn't use nearly the energy as the water heater does to wash in warm or hot water. The clothes dryer is one of the highest energy use appliance in most homes. Use a clothes line and you will save significant energy. Look for the "Energy Star" label on all household appliances, and buy the ones with the lowest energy use. 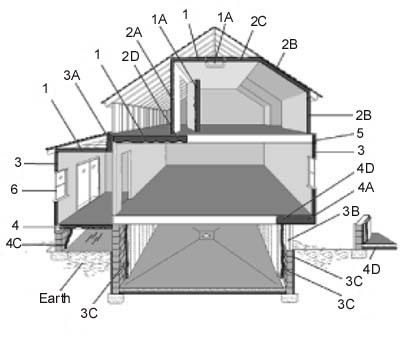 Home without adequate insulation should upgraded. The first place is in the attic, it is cheap and easy to add. The payback in energy savings is very fast since 1/3rd of heat lost is through the roof. If you walls are un-insulated we recommend adding it there too. It will pay you back for as long as you own the home and increase the re-sale value. 6. 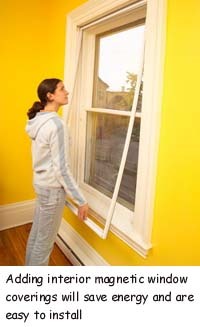 Replacement or storm windows and caulk and seal around all windows and doors.